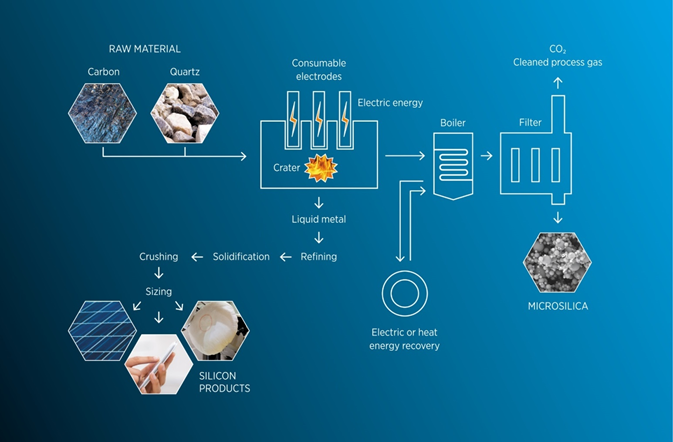 To understand silica fume, it becomes inevitable to first understand the smelting of silicon metal. Silicon is smelted in large submerged arc electric furnaces. A typical 20 MW furnace might be as large as 40 feet in diameter and 15 feet deep. There are 3 electrodes, which could be up to 60 inches in diameter. The furnace charge is quartzite, charcoal, wood chips and coal. The quartzite used for smelting silicon must be very pure and contain more than 99% silicon dioxide. The quartzite is usually river rock that has been very carefully washed to remove any fines. Typically, this rock is between 1 and 4 inches in diameter. The coal must also be very pure and washed to remove any fines. Alkalies and iron are undesirable tramp elements. The proper ratio of coal, quartzite, wood chips and charcoal are continuously added to the top of the furnace while silicon metal is tapped from the bottom. The coal, charcoal and wood chips provide an extremely reducing atmosphere near the bottom of the furnace and especially around the ends of the electrodes. Hot gases rising through the burden pre-heat it and the extreme temperature at the tips of the electrodes volatilizes the quartzite when it gets close to them. This silicon dioxide vapor reacts with the now porous, pure carbon to form carbon monoxide, silicon monoxide, silicon carbide and eventually silicon metal. The carbon monoxide gas rises through the burden and oxidizes to form carbon dioxide at the top of the furnace, where the atmosphere is oxidizing. Approximately a kilogram and a quarter of carbon monoxide are produced for each half kilogram of silicon. Just like the carbon monoxide, silicon monoxide gas also rises through the burden. If the porous carbon phases don’t strip away the last oxygen molecule, the silicon monoxide will eventually reach the oxidizing zone. While the carbon in the reducing zone of the furnace strips the oxygen from most of the silicon monoxide, some of it does escapes to the upper reaches of the furnace and the reaction of silicon to silicon dioxide gives us silica fume. The silica fume that reaches the top of the furnace is sucked up into the hood that covers the top of the furnace by powerful bag house fans. In order to meet very rigid environmental regulations, the bag house fans need to provide enough of a vacuuming action at the top of the furnace, so that no gases escape into the atmosphere and this does cause some problems. One of the reasons that the quartzite and coal are washed to remove the fines is so there will be no fines to be swept up the stack with the fume. Obviously, there are some fines still present and they do get pulled up the stack. For the silicon smelter, this isn’t a problem. But for silica fume consumers an excessive presence of fine quartzite and coal contaminants places the end product outside of specification limits. These are tramp elements or oversize materials that you don’t want in your silica fume. On the other hand, what does concern the silicon smelters is that partially ignited wood chips, are also routinely pulled up the stack. Smoldering wood chips and bag houses just don’t mix, so we have to separate the coal fines, quartzite fines, and wood chips, better known as “Heavies” from the silica fume. This is done first in the coolers and then in a series of cyclones that drop out all of the “Heavies”. After this cleaning and cooling operation, silica fume is captured on the bags in the bag houses. The bags can be shaken or the compartment of the bag house backwashed to knock the fume from the bags. The fume is then moved into a silo either pneumatically or with a screw conveyor. The earliest applications for high-strength silica fume concrete were in columns for High- rise structures. As concrete strength increases Silica Fume usage is varied and open to the imagination of the designers. It has become an integral part of many of the items we use in our daily life. In this section we have chosen some of the applications that demonstrate the versatility of the product. From High Performance Concrete (HPC) in construction projects to filler in lawn care products it is rather amazing how far this smoke by-product has evolved. column size can be reduced and reinforcing steel designs in the columns can be simplified. Smaller columns equates to more overall floor space available to the owner of the structure and a significant cost advantage, particularly in urban settings. Cast in place parking garages also moved quickly to incorporate High Performance Concrete into the structures. From a design standpoint it’s used for many of the same reasons as high-rise structures. However in this case service may be the most important factor, which is greatly affected by the parking decks susceptibility to chloride attack. The problem is caused by salt in the melting snow. Salt laden snow builds up on cars during driving in the inclement weather, when these cars eventually park in a garage the snow and salt melts leaving puddles of salt enriched water to seep into the concrete eventually attacking the reinforcing steel and causing deterioration of the concrete. 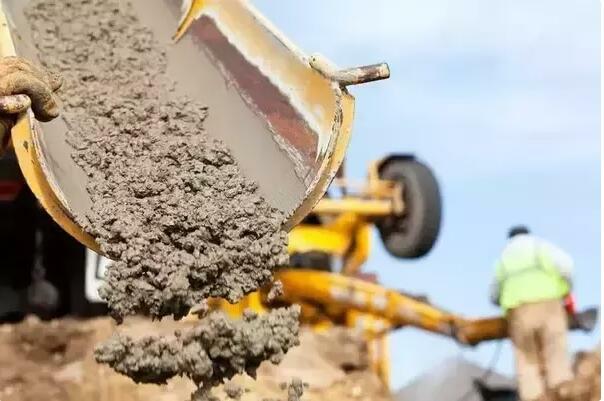 By using High Performance Concrete designers have found that the situation can be mitigated due the decreased porosity and increased durability of the HPC concrete. Silica fume aids in the flow ability of these products during production. But the main use of Silica fume is in the fire retardant grades because of its heat resistance capabilities.